Optimized High Precision Rigid CD Mechanism with Heavy Anchors Improves Vibration Control and Achieves Precise Signal Reading The CD-S3000 was created with meticulous care to ensure rigidity with superior vibration control properties and ultra-precise reading — to draw out all the music recorded to the disc. Incorporated is a newly designed drive mechanism with added heavy anchors for Yamaha’s own original loader mechanism. Installing it on the chassis through the heavy anchors in front of and behind the loader mechanism achieves the highest rigidity and blocks the effects of vibrations from outside. At the same time, it also prevents vibration caused by rotation of the disc from affecting the circuit board. The anchor on the front features two layers and a screw-based adjustment mechanism. This allows for highly precise adjustment of the horizontal level of the front-back and left-right sides of the loader mechanism. Each CD-S3000 unit is assembled by first attaching the drive mechanism to the chassis, then carefully performing minute horizontal adjustments. While this process is time-consuming and labor-intensive, it demonstrates Yamaha’s genuine desire to realize the ultimate in precise signal reading. These efforts eliminate any minute tilting of the mechanism, achieving stable rotation and ultra-precise signal reading. Reducing the load of the servo which drives the pickup, in order to minimize the impact of servo current changes to the signal, provides a clean signal output that is virtually unaffected by noise. In addition, the loader mechanism has a structure in which a highly rigid chassis designed for integration with the loader mechanism supports the entire CD drive. Moreover, only the strictest selection of parts was applied for the pickup, which aims a beam of light at the disc as it rotates at high speed to read the signals and a drive mechanism which stably rotates the disc. This is how audio data on the disc is read with high precision to achieve the highest purity in reproduction. High Rigidity Aluminum CD Tray The CD tray is made of high rigidity aluminum, reducing secondary vibrations due to resonance of the disc and the high-speed motor rotating the disc, resulting in improved audio signal-reading precision and quieter operation. In addition to the smart design and luxurious texture, we’ve fine-tuned the opening/closing action by adding a specially designed meshed wire drive, achieving smoother and gentler operation. We obsessively strove to give the unit a luxurious operating feel that perfectly matches the superior sound quality. High Rigidity Main Chassis Improves Anti-vibration Properties and Left-right Symmetrical Construction The main chassis, which supports the loader mechanism, was also made as strong as possible, and reinforcing each part improved the rigidity of the chassis itself. Moreover, the front panel is made of 0.28” thick aluminium, contributing to the high rigidity of the entire chassis. The unit is constructed by placing the loader mechanism, which is a rotating body, in the center, then placing the digital power supply and circuit board on its left, and the analog power supply and circuit board on its right, to achieve a total symmetrical structure with the digital and analog parts separated, achieving the ideal weight balance. Finally, to minimize impedance as much as possible, the bottom chassis, which is the standard ground, has been copper plated. Insulators Allow Use of Spikes or Pads The insulators are crucial parts that block outside vibrations. They adopt Yamaha’s original metal legs in order to maximize vibration control performance. The user can select point installation by applying the supplied spikes or plane insulation with the supplied pads and use these combined with an interlocking rack if desired. Independent Configuration of Digital and Analog Circuits The CD-S3000 has adopted a twin power transformer method, which completely separates the digital and analog circuits from the power supply and equips each with its own dedicated power transformer. Separating the digital/analog circuits from the transformer eliminates sound quality deterioration caused by interference and noise between the digital and analog circuit blocks, which occur when there is one digital/analog power supply. This results in exceptionally clear and low-noise reproduction of analog audio. The power transformer is a toroidal transformer with low magnetic leakage which, for both the digital and the analog units, lowers adverse impact on the signal read from the disc. Following detailed research based on trial listening, we enclosed the power transformer in a copper-plated case, in order to reduce the impact of magnetic leakage and vibration. This realizes a gentle, calm and even spacious sound, due to enhanced reproduction of detailed signals. This is one of the main aims of the S3000 series, to make sure that even gentle, soft sounds, such as those of stringed instruments, are reproduced accurately with rich expressive power. Digital/Analog Boards with Integrated Power Supply Circuits The internal design of the CD-S3000 does not separate the power supply circuit boards, which include the power transformer; the block capacitors are mounted directly on the respective digital/analog circuit boards. Thus, an original board configuration which integrates the power supply circuits was adopted. Eliminating cabling from the power supply circuits to each circuit board and mounting directly have the benefit of reducing connection loss, as well as achieving low impedance. Moreover, cabling from the power transformer utilizes the same screwtype connections we’ve given the companion A-S3000 Integrated Amplifier. Connecting directly without soldering achieves thorough contact point loss and low impedances. Single-stage Configuration I/V Conversion Circuit Enables Direct Analog Output To thoroughly eliminate audio signal loss, the CD-S3000 adopts an innovative circuit configuration for the analog circuit. The signal from the D/A converter is conventionally output as an analog signal through an I/V conversion circuit configured in multiple stages. However, in the CD-S3000, the signal is output by a single-stage configuration based on a discrete design of the I/V conversion circuit. This single-stage configuration with high slew-rate sharply lowers audio signal loss compared to a multi-stage configuration circuit and lowers NFB (Negative Feedback), eliminating any sonic suppression, resulting in a natural, spacious sound. The circuits beyond these D/A converters perform balanced transmission with a circuit configuration marked by symmetrical plus and minus sides. Using a balanced connection with the A-S3000 Floating and Balanced Power Amplifier lets you enjoy profoundly pure sound reproduction without any impact of transmission loss. Exceptionally High Performance 32-bit D/A Converter The D/A converter for the CD-S3000 is the ESS Technology ES9018 SABRE Reference Stereo DAC. We selected this after careful examination of all points—not only its high precision processing of 32-bit audio, but also the ability to handle large amounts of audio data, strength in the low register and high quality definition in the high register. Since it is constructed with the master clock inside the D/A converter, it is also features an original jitter eliminator function, permitting D/A conversion with extremely low impact of clock jitter. Moreover, an 8-channel D/A converter is housed inside the chip, and applies double differential operation using 4-channel D/A converters on the right and left sides respectively. It delivers exceptional high performance and high quality signal output with superior signal to-noise ratio, since it employs an analog signal processing circuit with balanced configuration. Built-in USB DAC Functions With high resolution audio sources becoming more and more common today, we designed the CD-S3000 for optimum enjoyment of those sources with superior D/A conversion and the unit’s balanced signal output, and equipped it with a built-in USB DAC function which allows direct input of digital audio (from a computer, etc.) through a USB terminal. The USB DAC employs an original IC, developed specifically for Yamaha. It has an internal master clock, and can perform low-jitter transmission based on asynchronous transmission, or receiving signals without being synchronised with the master clock in the PC. The unit is compatible with digital audio of up to 192 kHz / 24-bit resolution. ASIO 2.3 Yamaha Steinberg USB Driver The CD-S3000 supports the ASIO 2.3 protocol to take full advantage of the sound quality of the USB DAC function. The ASIO 2.3 protocol is a standard protocol for professional use digital audio or DTM, with a significant sound quality benefit: the ability to achieve lower delay and higher throughput than with a standard OS sound driver. The driver software is the ASIO 2.3 Yamaha Steinberg USB Driver*, and allows high quality playback of digital audio data stored to computer. *The software is available as a free download from the Yamaha web site. Pure Direct Mode Further Enhances the Quality of Analog Sound The CD-S3000 incorporates a special Pure Direct mode: When playing back analog audio, the display is turned off and the digital output circuitry is stopped, improving the quality of analog output. This enables a warmer, more natural sound with greater musicality, further enhancing the value of a fully balanced connection with the A-S3000. 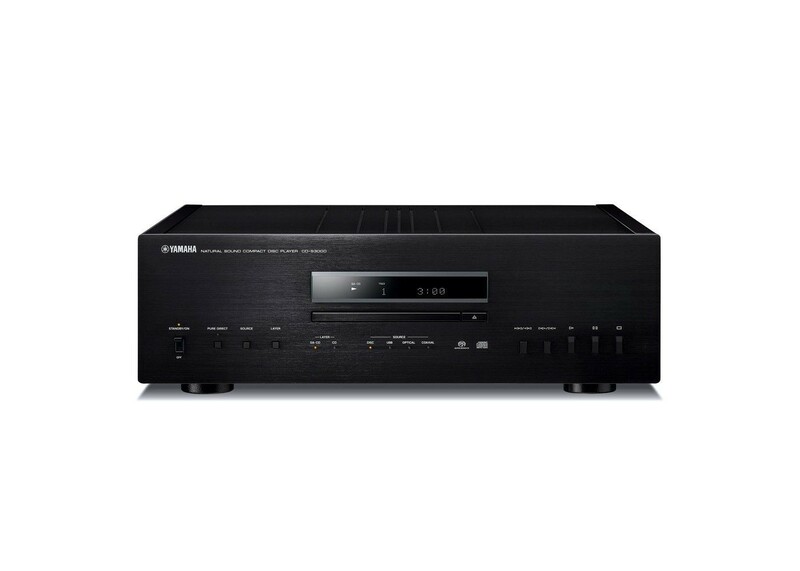 Meticulously Designed and Beautiful in Appearance — Just Like a Musical Instrument As befits a top-end audio component, the CD-S3000 gives off the presence of a fine musical instrument, with absolutely no screws or fasteners that can be seen from the outside. Every single aspect of its construction and design exudes master craftsmanship and reflects an obsession with quality—a truly musical quality possible only for Yamaha, a world class musical instrument manufacturer. The player with its refined design has been meticulously finished by skillful use of advanced processing technologies: integrating the top panel and side wood connection, leaving no gaps while using different materials—metal and wood—for the connection. On the CD tray, the gap between the front panel and the tray is uniformly precise. Moreover, the beautifully finished half-mirrored glass window of the display is precision-fit to the front panel smoothly without gaps—lending an exceptionally elegant appearance to the unit. Remote Control with Simple Design and Superior Texture The supplied remote control is designed in the same way as the aluminum panel of the CD player itself, with a simple, easy-to-understand button layout and gorgeous metallic texture. In addition to the basic CD track selection and play controls, it can also be used to adjust the volume and switch input sources on the companion A-S3000.